The Spot Central Hostel, Sewilla, Hiszpania : Rezerwuj teraz! Best Staff Award February, Best Atmosphere Award...Amazing location, helpfull staff... what else could a traveler ask? 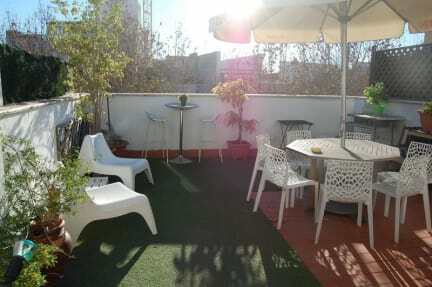 The Spot Central Hostel could be the best located hostel in Seville. Everything is within walking distance. The Hostel is in a unique position because it is just 250metros of the main attractions of the city, the Giralda and the Cathedral. It is also found just 50 meters from the Plaza de Toros de La Maestranza and river Guadalquivir. Enjoy your Welcome drink in our rooftop terrace, join in our free walking tours, rest in our air conditioning rooms... 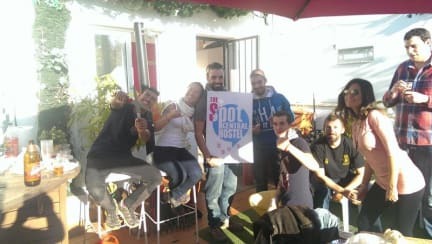 Enjoy the Spot & Enjoy Sevilla! Have a Great Day, Everyday! Today is an area where there are numerous local nightlife, where you can go on holiday without worrying about buses or taxis. From Scottish pubs, Irish, disco music, funky music to the finest sites in Seville a few meters from the Hostel. It is in a tourist area that also has easy access by car or public transport. It has a taxi stand 15 meters from the gate bus line, 10 meters to stop metroligero Metrocentro 270metros and metropolitan bus station, national and international Square at 850 meters. Nearby there is also a food market, shopping and entertainment, local flamenco and traditional tapas bars and restaurants. Our friendly staff will ensure that all guests have a great stay in Seville. Please, advice about your arrival time specially if you plan to arrive between 2am and 8 am. Breakfast is included in the price of the room. Conditions for children and extra beds: Children can not stay at the property. There is no capacity for extra beds in the room. Deposit conditions: No deposit will be charged. Cancellation Policy: If you cancel or modify the reservation up to 7 days before the date of arrival, the establishment will not charge. If you cancel or modify the reservation after the deadline or you do not show up, the establishment will charge the entire stay.